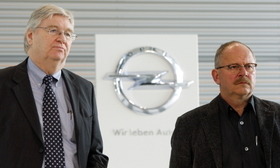 Opel Labor head Klaus Franz (left) says GM Europe President Nick Reilly personifies the New GM. MUNICH -- General Motors Co. could give Opel/Vauxhall workers a stake in the company to win concessions on planned job and wage cuts, GM Europe President Nick Reilly said. Reilly was speaking to reporters after he had addressed about 9,000 employees at Opel's headquarters in Ruesselsheim, Germany. GM and its German Opel workers took a big step toward reconciling differences when Reilly said plans to cut nearly 550 jobs at Opel's Ruesselsheim engineering center would not go ahead. Reilly said the U.S. automaker wasn't pursuing a short-term policy of slash and burn at its European arm but instead looked to offer staff a future. "Management and the works council agree on the goal of making Opel/Vauxhall a successful company once again with greater independence and a more important role within GM," Reilly said. Opel senior labor leader Klaus Franz said he is willing to find a solution that swaps wage reductions and job cuts for concessions from GM that could elevate the importance and autonomy of Opel. "It has a lot to do with the personality of Nick Reilly. He personifies for me New GM," Franz told reporters, adding that he was encouraged by news that GM would no longer look to cut 548 engineering jobs in the development center in Ruesselsheim. Franz has strong ties to German government officials and was far more visible in Germany than any GM executives during months of negotiations to rescue Opel from GM's brief U.S. bankruptcy. He has been particularly vehement in his desire to see more local engineering work to develop smaller, more fuel-efficient models better tailored to European tastes. Reilly needs labor's support to contribute 265 million euros ($399.4 million) in annual savings and help facilitate his request to European governments for state aid to support GM's 3.3 billion euro Opel restructuring plan. Franz said he would meet GM Chairman and CEO Ed Whitacre on Monday in Detroit.